Wipro Previous Placement Papers helps students/ Freshers in getting their dream job. Wipro is one of the top most MNC Company in India which provides services for IT, business and technology consulting. Wipro conducts off-campus drives every year and recruits freshers for its branches in India. To get a job in Wipro, Candidates have to prepare well for the written exam. The written exam contains the questions on Aptitude, English, and Reasoning. The questions in Wipro written exam are quite simple. But to know the type of questions and model of the questions, you need to check the previous placement papers. Here Jobling is providing the previous placement papers of Wipro. So candidates who are attending the Wipro Assessment Test are requested to practice the previous placement papers. Here we have collected previous year placement papers of Wipro from various sources. Wipro off-campus drive (or) Wipro walk-in for freshers contains three rounds. Let’s have a look into the Wipro Exam Pattern. The Online Assessment test of Wipro has three sections (Aptitude, Reasoning, and Verbal). Selected candidates in the first round(Online Test), have to face the technical interview on the same day. In the technical interview there are questions on C language and C++, moreover, you are asked to write a C program with an explanation. If the interviewer is satisfied with your answers, then you have to face the HR interview. Most of the questions in HR round are related to personal, educational, background, and decision-based. Also, note that sometimes companies will change their exam pattern. So we need to update accordingly. 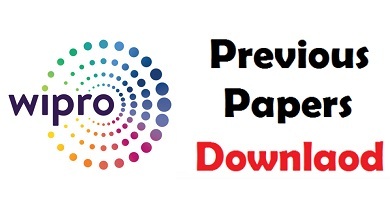 Go through the below links to download the previous placement papers of Wipro in PDF format. We have collected these papers from various sources. If you have found any errors, please respond through the comment box.